A month just ended, which means new stats. In the world of web browsers, there are two particularly interesting ones of significance. One points to “open” web browsers now in the majority amongst those that surf the web. Another points to WebKit browsers passing Firefox, to claim the number two position amongst web surfers. As first noticed by Google’s Peter Beverloo this morning, StatCounter’s July numbers show that Firefox and Chrome, when combined, now account for over 50 percent of web browsing. Technically, Firefox now has a 27.95 percent share, while Chrome has 22.14 percent. Combined, their 50.09 percent easily beat IE’s 42.45 percent. “According to StatCounter, open-source browsers now serve the majority of the Web!,” Beverloo wrote this morning. Technically, that’s sort of inaccurate since it’s Chromium and not Chrome itself that is open-source, but we’ll let it slide. Any way you slice it, the milestone is pretty amazing. Especially when you consider that as late as 2006 by some counts, IE still had over 90 percent market share. StatCounter’s numbers also show something else: Chrome is rising so fast that it should surpass Firefox in the next few months. As the numbers above indicate, the two are now just under 6 percent apart — the closest they’ve ever been. And while Chrome continues to rise, Firefox has been falling for the past year. If that trend continues, Chrome should surpass Firefox before the end of this year. Of course, that’s just one measurement tool. There are many out there. And another shows something else interesting for the month of July: WebKit browsers are now second to only IE, as AppleInsider pointed out earlier today. NetMarketShare’s numbers point to this milestone. They have Chrome at 13.49 percent and Safari at 8.10 percent. Combined, that puts the WebKit-based browsers at 21.59 percent, just ahead of Firefox’s 21.47 percent. IE still has 52.71 percent share, by their count. Why the discrepancy between the two sets of stats? One reason is that NetMarketShare’s numbers include all browsers on all platforms, while StatCounter’s numbers focus on computer-based browsing. In other words, mobile browsing is included in one, but not the other. That’s why Safari is much higher in NetMarketShare’s numbers (StatCounter has Safari at 5.17 percent — still an all-time high there). Another reason for the differences are is that the two services rely on different ways of getting their numbers. Regardless, the trends are clear when you look at both sets of stats: IE continues to fall, Firefox continues to dwindle, Safari continues to rise slowly, while Chrome continues to skyrocket. This means good things for both “open” web browsers (Chrome + Firefox) and WebKit browsers (Chrome + Safari). For what it’s worth, TechCrunch’s own numbers show the same basic trends: Chrome and Safari have been on the rise for some time now, while Firefox and IE have been falling. The difference is that Chrome is already the dominant browser on TechCrunch (and has been for some time) — in fact, it’s now nearly a full 10 percent past number two, (and long-time champ) Firefox. 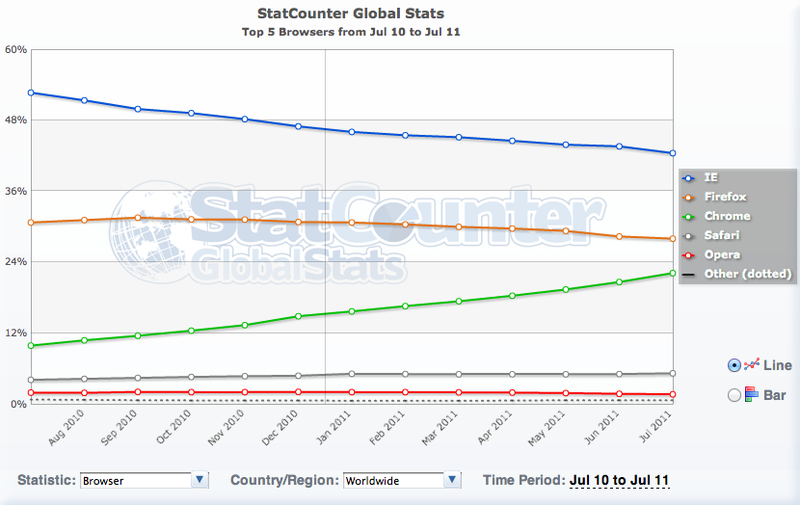 Chrome had a 32.64 percent browser share amongst TechCrunch readers in July, while Firefox had 23.59 percent.